Wedding coming up in a few months? Corporate with important business people? A get-together with your families and friends for your birthday? Make your invitations extra special with save-the-date magnets. Announce your special events in a stylish and trendy way. Send your guests a unique save-the-date card that they can put on their walls and refrigerators. Print your personalized save-the-date magnets with NextDayFlyers. Our save-the-date magnets are coated with a special laminate to keep them durable. Upload your own design or use our online design tool to create one from scratch. After everything is perfect, your order can be shipped to you as soon as the next day! Complement a traditional wedding invitation with a save-the-date magnet that they can stick on your family and friends’ fridges. This would help them prepare for hotel reservations and other arrangements to be with you on your special day. Having a child is one of the most important aspects of family life. 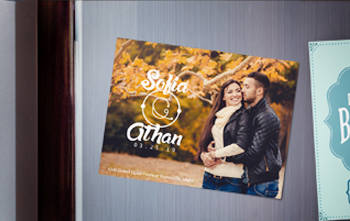 Announce that you are expecting with a trendy save-the-date magnet for your baby bash. Friends can have quite a hectic schedule. Make sure that all your friends will be available and present at your graduation party by sending them a save-the-date magnet and they'll be there for you. Save the Date Magnets is rated 5.0 out of 5 by 3. Rated 5 out of 5 by SCFW from Great! Great Product! Quick Service! Already planning to order from them again. Rated 5 out of 5 by Elizabeth from Really nice Save the Date magnet (no envelopes) I ordered these as our magnet save the dates; the image quality was excellent and looked just like the proof online. I actually got a few extra in my order (I ordered 100 and got 106 magnets). Did not include envelopes, but was able to buy 4x6 envelopes off Amazon for about $10 for 100 (and got some that matched our wedding colors; even better than white)! The magnet is thin and flexible but strong and holds onto the fridge really well. Would definitely use them again! Rated 5 out of 5 by Becky Vinson from Looked great! We were very happy with the magnets, thank you very much!